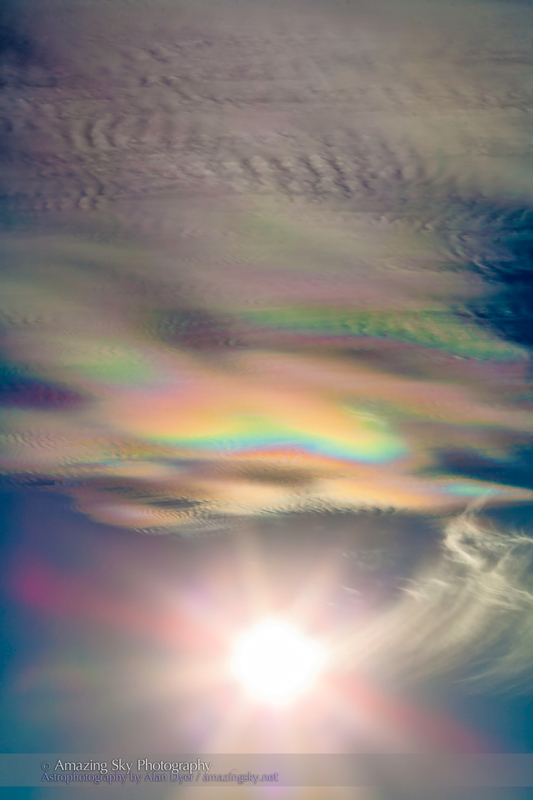 High clouds shimmer with iridescent colours near the Sun in an unusual display of atmospheric optics. As I was getting ready to shoot the sunset at White Sands National Monument last evening, December 10, I looked up at the late afternoon Sun and saw it embedded in thin clouds tinted with iridescent colours. My dark sunglasses helped me see the phenomenon by eye, and underexposing the image helped me capture the colours by camera. The effect is more common than you might think, but being so close to the blinding Sun iridescent clouds often go unnoticed. The almost metallic-looking colours are caused by clouds made of water droplets of such a uniform size they diffract the sunlight and spread the white light into a stunning range of colours. This image frames the scene in portrait mode. I took several images over the few minutes the effect lasted. But the clouds soon moved off or changed structure and the iridescence faded. 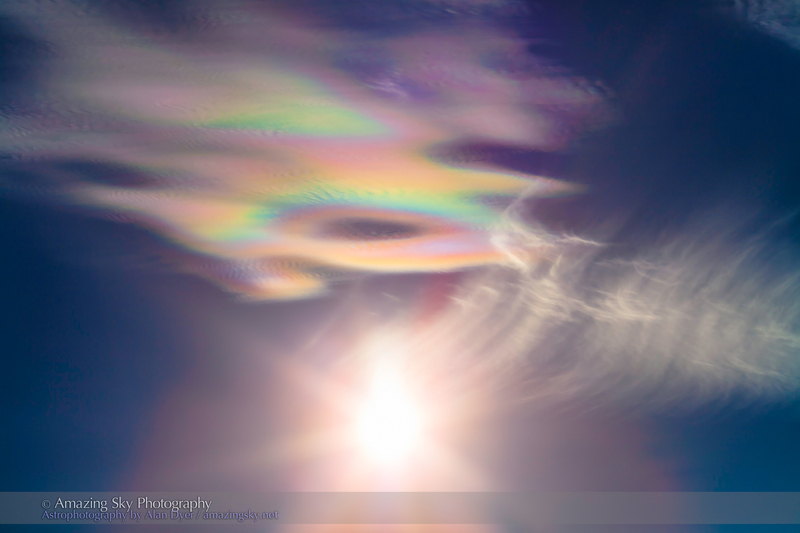 Despite the Sun shining through similar looking thin clouds the next evening, December 11, I saw no such iridescence. 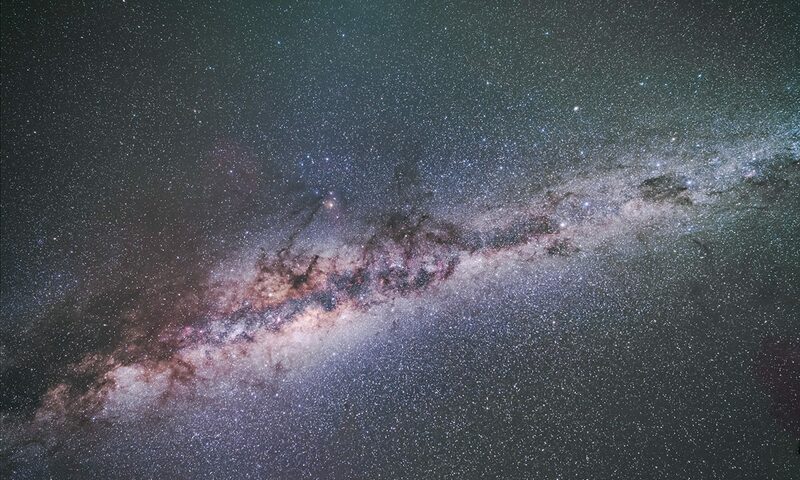 For more information see Les Cowley’s excellent page at his Atmospheric Optics website. It’s just another example of the wonderful phenomena of light and colour that the sky can present to the watchful. Amazing! And I thought sundogs were cool.